On a potentially dangerous night of the year for child pedestrians, Safe Kids New Jersey urges parents to prepare children to act safely and drivers to take extra precautions. 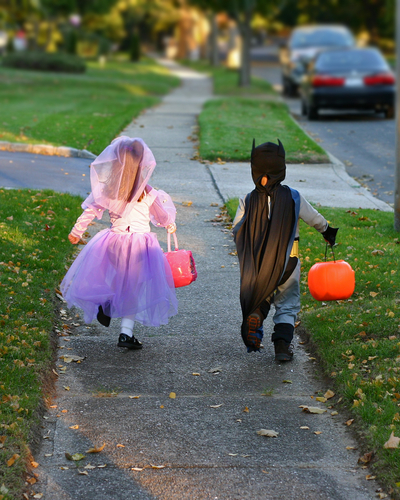 On average, twice as many kids are killed while walking on Halloween compared to other days of the year. Kids need proper safety instruction before they go out trick-or-treating. Many kids will be out trick-or-treating while it is dark and thus more difficult for drivers to see them. There are several simple and effective behaviors that parents can share with kids to help reduce their risk or injury. For example, children younger than age 12 should not be alone crossing streets on this night without an adult. If older kids are mature enough to go trick-or-treating without adult supervision, parents should make sure they go in a group and stick to a predetermined route with good lighting. Drivers need to be extra alert as there will be more children on the streets and sidewalks – and may also be focused on gathering candy and the excitement of the holiday. Drivers – be sure to slow down on neighborhood roads to make Halloween more enjoyable for everyone, but also to help save lives. Cross the street safely at corners, using traffic signals and crosswalks. Look left, right and left again when crossing and keep looking as you cross. Walk, don’t run, across the street. Slow down and stay alert – watch out for cars that are turning or backing up and never dart out into the street or cross in between parked cars. Costumes can be both creative and safe. Decorate costumes and bags with reflective tape or stickers and, if possible, choose light colors. Masks can obstruct a child’s vision, so choose non-toxic face paint and make-up whenever possible instead. Have kids carry glow sticks or flashlights in order to see better, as well as be seen by drivers. While glow sticks are good for visibility, remember that the liquid in glow sticks is also hazardous, so parents should remind children not to chew on or break them. Slow down in residential neighborhoods and school zones. Remember that popular trick-or-treating hours are 5:30 to 9:30 p.m.
Be especially alert and take extra time to look for kids at intersections, on medians and on curbs. Children are excited on Halloween and may move in unpredictable ways. Safe Kids Walk This Way! Child pedestrian injury remains the number two cause of unintentional injury death among children ages 5 to 14 in the U.S. Safe Kids New Jersey Coalitions were joined by FedEx volunteers and local school children to raise awareness of pedestrian safety on International Walk to School Day, October 7th. This year marks the 10-year anniversary of the Safe Kids Walk This Way pedestrian safety program and the partnership with program sponsor FedEx. Through the year-long program, children learn safe pedestrian behaviors and together with Safe Kids, school communities identify local pedestrian hazards and educate pedestrians and drivers about safe behaviors and improve environments for child pedestrians. Learn more about the Safe Kids Walk This Way program.